Here is what is interesting. The following picture shows the flow how the back propagation algorthm works(the calculation in the picture is meaningless, it is just used to describe the idea of Back Propagation. So ignore it). The basic idea of back propagation is, the strength of the links between nodes of different layers will change according to users' feed back (The difference between expectation and real output). Here is the code how back propagation algorithms implemented. //The reason of caculating slope of output is, when the output is larger, the average strength of links between hidden layer and the output nodes is more strong. 1. Caculate the difference between the node's current output and the expected value of this node. 2. Use dtanh to determine how much the node's total input has to change. (delta output) (Why use dtanh? The reason is, when the link is strong, we need to change its strength more careful. So if you see the curve of dtanh, you can find that dtanh just do what we want.). 3. 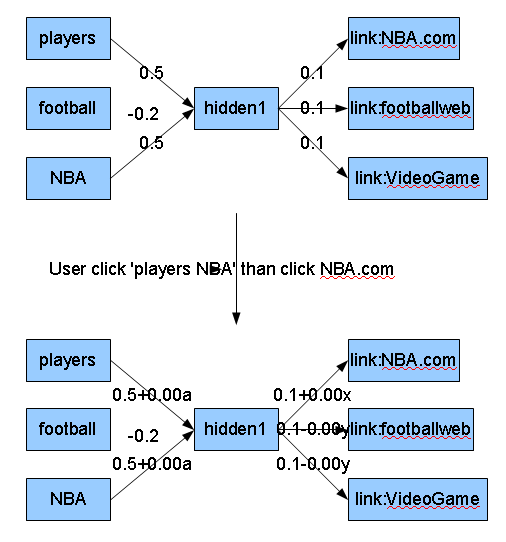 Change the strength of every incoming link in proportion to the link's current strength and learning rate. 1. Caculate the error of hidden node by sum up the strength of every node in output layer mulitpled by its delta output. 2. Use dtanh to determine how much the nodes's total input has to change. Notes, before running back propagation, it is necessary to run feeding forward to know the ouput of each node. One of the magic of neural network algorthm, especially its hidden layer, is that it can make reasonable guess even though the input query is never seen before.